First, sorry to have disappeared for a few days. The combination of a pretty nasty virus inserting itself into my laptop, and the deadlines that led to me pulling out of Seattle’s Emerald City Comic Con, stalled the regular updates here. The good news: I’m already committed to Emerald City for 2011, the first time it’ll be a three-day affair; and, my laptop seems to be back in working order. So expect regular updates as well. Despite missing the con, I was at least able to participate in the Top Cow panel on Saturday via cell phone. You can read the details here. Every publisher saves their announcements for conventions, and this was no different, as Top Cow named my first artistic collaborator on the upcoming Artifacts series, the 13-part event intended to redefine its universe. Joining me for issues #1-#4 will be penciler Michael Broussard, who is just coming off of a pretty stellar run on The Darkness with my buddy Phil Hester. I’m absolutely looking forward to working with Michael again. 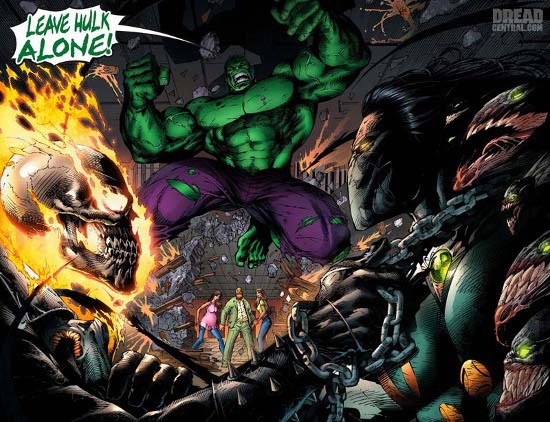 I wrote one of his first published jobs, the Marvel-Top Cow crossover book Unholy Union, which featured Witchblade, the Darkness, Hulk, Ghost Rider and even a couple pages with Doctor Strange. I’ll take advantage of even the slightest opportunity to write Doctor Strange, and Michael’s Doc pages are among my favorites. Michael was even kind enough to do a Doc piece in my sketchbook. Once that sketchbook makes its way back from the West Coast, I’ll use the blog to show off some of the art within. Michael’s work certainly has what a lot of people might call a “Top Cow style,” meaning something in the same ballpark as that of Top Cow founder Marc Silvestri. I think there’s a perception out there, at least in some people’s minds, that the Top Cow studio somehow imposes a stylistic edict on its artists. Not true. 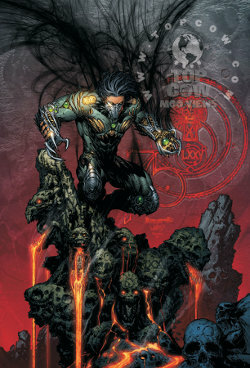 Top Cow has launched a pretty impressive collection of artistic careers, including Michael Turner, Brandon Peterson, David Finch, Mike Choi, Francis Manapul and Billy Tan. True, many of those guys share a certain sensibility, which is understandable given that all had some tutelage under Silvestri. But you also have to factor in current artists like Stjepan Sejic, Kenneth Rocafort and Nelson Blake the 2nd, who have pretty diverse styles. Michael is one of those rare artists who emerged with a great deal of polish, even at the beginning of his career. Most guys slave away for years, getting better in little steps until they’re finally ready for professional-level work. Michael showed up at that level already, and has only gotten better since. I’m looking forward to working with him again a great deal. At one of the previous Emerald City Cons Michael and I were able to take a walk around town prior to the show opening. We ended up at a coffee shop, talking at length about art styles, influences and storytelling. Why only issues #1-#4 of Artifacts for Michael? We’re going to be splitting up the series between four art teams, both for scheduling purposes and as a reflection of traditional three-act story structure. Crossover/event series are notoriously difficult to keep on schedule, as the shipping woes and artistic musical chairs of some Marvel and DC projects can attest. The intent is to circumvent that by having three art teams working at the same time, getting ahead so we can continue to ship on time. The art teams for issues #4-#7 and #8-#12 will be announced in due time, and we have something pretty special planned for issue #13. Artifacts #1, by me and Michael Broussard, will be out in July.